That’s a fantastic picture, David! Looks like beautiful countryside there. Your comment about the cows reminded me of a tidbit I read regarding those gentle creatures, that they can recognize up to 70 other cows in their herd. And you really must share the picture of the rabbit warren at some point. The flowers are in bloom here, including the rhododendrons! Keep a look out – He has the link to your blog – he may want to check out your rhododendrons! Cows aren’t always gentle – the guy who owns the corner cows (not this bunch) has just spent three days in hospital after having had sharp words with one of his – luckily just badly bruised – no broken bones. It is beautiful countryside! And even more amazing – that’s the view from my window. We work hard appreciating it every day. I’ll try and squeeze the bunnies into the schedule – it was a bit of serendipity really – I just pointed and clicked at something I thought moved and was surprised to find a photo full of rabbits when I got home. My sister (that’s her in the comment below – at http://www.rosetodd.com ) is the one who knows all about the flower essences, and some has rubbed off on me. Edward Bach insisted that they had to be made from flowers that grew here in England so they haven’t really taken the world by storm. I think there are people trying to do the same thing in the US and Australia – but the originals are the ones that actually work. But hey! Don’t be too hard on the lad – lacking focus is what being 12 is all about – or 13, or 14, or 15 or . . .
Poor son of mine, I’m sure I’m too hard on him, but he’s the eldest. It’s his lot in life. The school gives him trouble, too, but I expect he’ll be alright in the long run. I’m pretty proud of his many good qualities, though I won’t embarrass him by listing them. If I miss the rabbit warren in my reader, I hope you’ll give me a nudge. I would hate to miss it! Love the picture of the train and all the green. We have white chestnut everywhere down here, but I haven’t seen any oak yet. So, much keep a watchful eye. You might be too late down there. 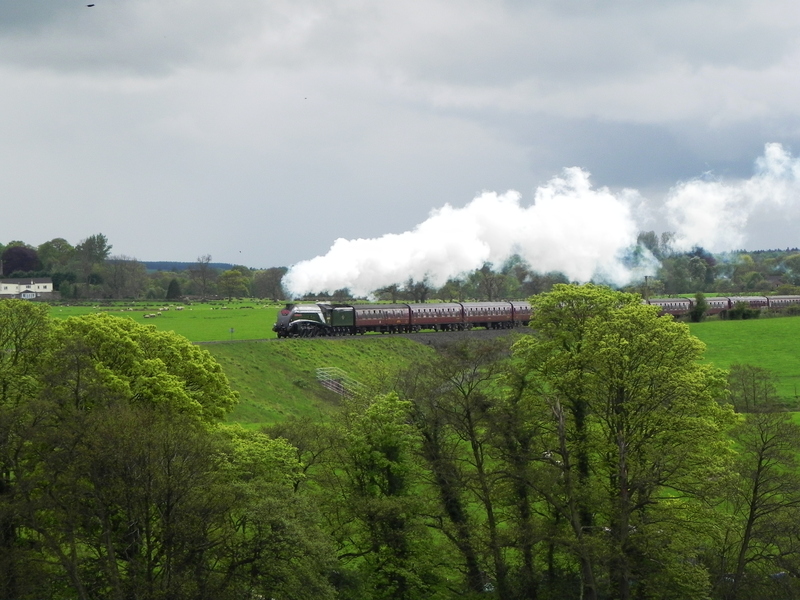 Lovely picture the train chugging along in the green flora makes one feel so calm and peaceful. Thanks for the share.